In which Robyn Page and Phil Factor try to get to grips with the difficult subject of SQL Server Alerting, and give you enough detail to put effective alerting systems into your database. To keep a database system running without hitches, you have to know of anything out of the ordinary that has happened. You need to know about events, error conditions, extreme loading, problems with the hardware, security issues, performance-related conditions, failed processes, rollbacks, deadlocks, long-lasting processes, ‘expensive’ cached query plans, and a range of other factors that could signal trouble. It is not enough to occasionally browse the error logs: you need to be notified. In a sense, a database experiences discomfort and pain. Any organism needs to feel pain in order to take action to do something about the cause of the pain. A database needs to react to ward off the possibility of failure, and the DBA must be able to respond as quickly as possible to signs of potential failure, or when actual failures occur. Alerts are provided to allow the programmer or administrator to react. If you are involved in supporting a high-availability server, you’ll know that the skill is in heading off problems at the first signs of trouble. To see those signs, you’ve got to be on the lookout for them, but you must ensure that they are drawn to your attention. Alerts provide the means to do this. A few terms before we start: an alert is defined as an automated response to an event. The term “event” in SQL Server is not particularly well-defined. In previous SQL Server versions, an event was anything that could be written to the SQL Server Error Log, and, in later versions, the Windows Application Event Log. Currently, an event seems to mean “any state or condition in SQL Server that can cause an alert”. In any case, events that are generated by SQL Server are also, by default, written to the Microsoft Windows application log. The SQL Server Agent reads the application log and compares any events it finds there to alerts that you may have defined. When SQL Server Agent finds a match, it fires an alert. SQL Server events – based on the occurrence of specific errors, or errors of a specific severity, and so on. Performance conditions. – You might define a performance counter on a certain object and set an alert to be fired when a certain threshold condition is reached. Windows Management Instrumentation (WMI) events – an alert is raised when a specific SQL Server event occurs that is monitored by the WMI Provider for Server Events. 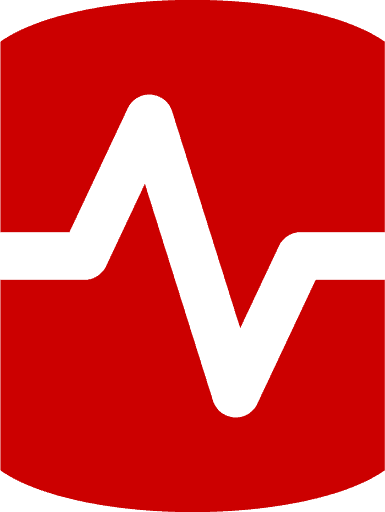 In the procedural world, you’d think of the alerting system as the place where you define call-backs to your code on various database conditions. 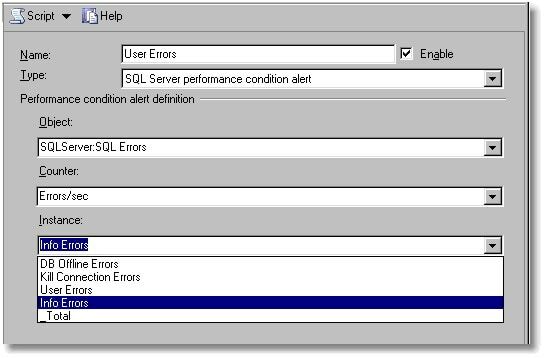 In SQL Server, you define an alert to inform you of errors, events or conditions, so that you can take remedial action. Some events require investigation; some can be dealt with by a script. Others require both. 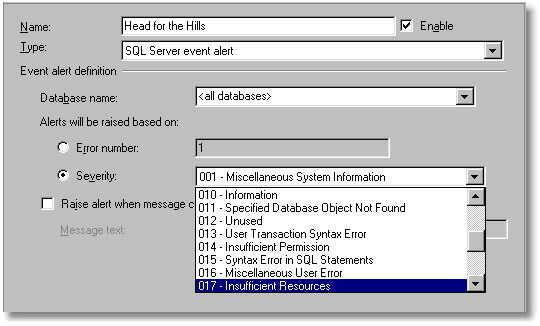 SQL Server alerts can be set up to send a message, or to execute a script. The messages sent to an operator, or administrator, to inform them of an event are referred to as notifications. Alerts were a late arrival in the evolution of SQL Server. The original design was for a crude but effective system, based in SQL Server Agent, which simply read the SQL Server Error log (now it reads the Application log) and scanned for errors of a particular type or severity. Upon finding one, it could start a TSQL Job and send a message as a notification. This was useful, but provided little information that could be used to take preventative measures before an error happened. When the means of monitoring SQL Server performance became more sophisticated, two separate notification systems were devised. One of these was based in the operating system, using Performance Monitor, and provided both notifications and command-line executables. The other one used the alerting service of SQL Server Agent, and provided for the triggering of TSQL-based Agent jobs as well as notifications. This latter system has the SQLServer counters, but not the general Operating system ones. Finally, when WMI was introduced in SQL Server 2005, it seemed an obvious idea to allow the Alerting system to make WMI queries, so a fourth type of Alert was added. The WMI alerting system is comprehensive, and covers aspects that the previous systems missed, but is wildly complicated for a busy DBA to get to grips with. Very often, the programmer is happy to present the end-user of the database with all error information. This is a bad idea. If, for example, the transaction log has run out of space, there isn’t much the end-user can do other than to phone the DBA, panic, or curse the IT department. A simple use of alerts is to allow the DBA or developer to receive a copy of any error that can appear in the error log, as pager alerts, emails, or SMS messages. Events are generated by Microsoft SQL Server and, if they are flagged as being ‘logged’, are entered into the Microsoft Windows application log and SQL Server Error log. The SQL Server Agent, which is a separate application, reads the application log in order to see if any events that have been written there have been defined by you in an alert. If so, the Agent fires whichever alert defines the error in the most precise way. This means that a specialised alert that is triggered by an event with a particular error number will be chosen rather than a more general one that will fire if it is of a particular severity. You can raise alerts based on the error number or the error severity. This means that it is pretty easy to define an alert that will fire on every error, for an error of the specified severity level, and give you an email notification. A curiosity of the SQL Server Event Alerts is that you cannot configure an alert that fires on all events above a particular severity level. To get anywhere near providing a ‘catch-all’ alert, you need a performance alert, which we’ll come to. If you wish to stick to SQL Server Event alerts, you will need to create alerts for every severity level. This gets very boring to do via SSMS, and it is much easier to do in a script. However, it is a job that only needs to be done once for an application in order to get effective alerting for your ‘loggable’ errors. You can then go on to create a more sophisticated alerting system, based on alerts that fire only on specific errors. When an error occurs, the alerting system selects the alert that covers the error, rather than one that fires on a type of error. Sometimes, events will fire repeatedly over a short period of time. In this case, you may want to know that the event has occurred, but you may not want an alert for every event. To avoid getting repeated messages, you can specify a delay after the alert responds to an event, in which case SQL Server Agent waits for the delay specified before responding again, regardless of whether the event occurs during the delay. You can also disable, and re-enable an alert programmatically. SQL Server Agent takes these errors from the error log, so if follows that the errors must be logged in the first place. There is no way of attaching alerts to errors that aren’t logged. All error messages with a severity level from 19 through 25 are written to the error log automatically. So, what if you want to log information messages, or messages of low severity? If you wish to have an alert on any errors that are of a severity less that 19, then you have to modify their entry in the sysmessages table to set them to be always logged. You do this using sp_alterMessage with the WITH_LOG option to set the dLevel column to 128 . If a message has been altered to be WITH_LOG, it is always subsequently written to the application log, however the error happens. Even if RAISERROR is executed without the WITH LOG option, the error that you have altered is written to the application log, and is therefore spotted by the alert. There are good reasons for wanting to do this, as it will then log, and optionally alert you to, syntax errors that are normally seen only by the end-user. Errors with the higher severity levels are something you need to know more about, especially if a user is going to phone you anyway after seeing a scary message in his application. The severity levels provide the best means of creating a general-purpose alerting system, supplemented by special alerts for common problems, such as TempDB running out of space. are generally generated though mistakes by users, problems in the TSQL scripts and stored procedures executed by users. A number of programming errors and input problems can cause this sort of error. The problem here is that they aren’t logged and it isn’t normally possible to get them logged. are generated by resource or system errors; the user’s session is not interrupted. require the attention of the DBA, who can then get more information by executing DBCC CHECKDB (database) to find out more about the extent of the damage. A severity level of 19 (SQL Server Error in Resource) will stop the current batch. Indicate system problems. Errors messages with a severity level of 20 or higher are considered fatal errors and terminate the client connection. Errors messages in this range may affect all of the processes in the database, and may indicate that a database or object is damaged. These errors are fatal to the process running at the time. The process will record diagnostic information, and then terminate. Tokens are extraordinarily important for creating anything but the very simplest alerting system. If you use an alert to fire a job, you then get a number of useful bits of information passed to the job, which can then be used to pass more information to whatever system you put in place to remedy the problem. The Current date (in YYYYMMDD format). The Instance name. For a default instance, this token is empty. Prefix for the program used to run CmdExec job steps. Current time (in HHMMSS format). The time (in HHMMSS format) that the job began executing. The date (in YYYYMMDD format) that the job began executing. WMI Property. For jobs that run in response to WMI alerts, the value of the property specified by property. For example, $(WMI(DatabaseName)) provides the value of the DatabaseName property for the WMI event that caused the alert to run. Tokens are replaced at runtime like traditional Macros, before the job step is executed. They are, unfortunately, case-sensitive, and you get unexplained errors if you leave spaces around brackets. They need to be handled with care because, if you are not aware of them, then they can cause unintended chaos in your code. They are notoriously hard to debug with anything more sophisticated than a ‘PrintF’. I usually write the results of the macro substitution to a table, before executing them as SQL, just to check that all is well. As tokens are strings, you need to use special macros to ensure that they execute. Actually, you now have to use them even if you don’t think you need them. This is why the ESCAPE_NONE macro is provided. Escapes single quotation marks (‘) in the token replacement string. Replaces one single quotation mark with two single quotation marks. Escapes double quotation marks (“) in the token replacement string. Replaces one double quotation mark with two double quotation marks. Escapes right brackets (]) in the token replacement string. Replaces one right bracket with two right brackets. Replaces token without escaping any characters in the string. This macro is provided to support backward compatibility in environments where token replacement strings are only expected from trusted users. For more information, see “Updating Job Steps to Use Macros,” later in this topic. Be warned: in SQL Server 2005, these tokens are disabled ‘for security reasons’. Before you use these tokens, you must enable their use by right-clicking SQL Server Agent in Object Explorer, selecting Properties, and on the Alert System page, selecting ‘Replace tokens for all job responses to alerts‘. In SQL Server 2005, the SQL Server Agent job step token syntax has changed. Now, an escape macro must now accompany all tokens used in job steps, or else those job steps will fail (see http://msdn2.microsoft.com/en-us/library/ms175575.aspx) . It is therefore best to write all tokens with escape macros around them so as to be backward-compatible. An example should make that clear. Here is a job step that writes any error passed to it from a SQL Server event, and includes the full text of the error, with the severity and error number, so you can put it into your database application’s own private log. You’ll see that it includes the database and server as well, just in case you aggregate these messages into an enterprise-wide report. ‘Object’ or type of performance measure to be monitored. ‘Counter’, or attribute of the measure to be monitored. Specific ‘instance’ (if any) of the attribute to be monitored. The behavior that produces the alert (e.g. ‘falls below’, ‘becomes equal to’, or ‘rises above’ a number specified for performance condition counter. By way of example, if you wanted to set an alert to occur on ‘SQLServer:Locks’ (object) when the Lock Requests/sec (counter), the number of new locks and lock conversions per second requested from the lock manager, exceeds 10, then you would choose ‘rises above’ (behaviour) and specify 10 (threshold) as the value. Another obvious alert is one that warns of an error being written to the error log. This uses SQLServer:SQL Errors object, with the Errors/Sec counter with the User Errors instance. This will fire an alert for all SQLServer errors. Faced with the huge variety of event counters that can be used to fire alerts, there really is no alternative but to leap headfirst into Books Online. Be assured, that there are counters for every imaginable conditions and some that are unimaginable. A curious behavior of some of these alerts is that the alerts often fire continuously (every twenty seconds) even when the counter is no longer at the specified level. I take the precaution of disabling, and then re-enabling the counter in the associated job if this happens. It is difficult to reconcile this with the documentation and I’m curious as to why this happens. The WMI alert provides far more information than is possible by using the previous types. Be warned, though, that you need to allow plenty of time to get WMI alerts working. This is not for the faint-hearted. SQL Server Agent can, in SQL Server 2005, raise alerts after the occurrence of Windows Management Instrumentation (WMI) events. SQL Server Agent can respond to SQL Server WMI events, as well as to WMI events raised by the operating system and other WMI providers. SQL Agent can even be persuaded to respond to remote WMI events but Microsoft does not encourage this. The instance_name defaults to MSSQLSERVER in a default installation of SQL Server. To create a WMI event, you need to specify the WMI variable that will be used. WMI variables are accessed by a variety of SQL syntax called ‘Windows Management Instrumentation Query Language’ (WQL). SQL Server Agent submits a WQL request, receives WMI events, and runs a job in response to the event. Several Service Broker objects are involved in processing the notification message, but the WMI Event Provider handles the details of creating and managing these objects. Because of the underlying use of Service Broker, it must be enabled in msdb as well as in the database you are monitoring, before you can hope for SQL Server Agent to receive WMI events. A WQL query references the event to set up the WMI Alert, using “SELECT * FROM <my_event>” syntax. To make this work, one must configure SQL Server Agent to “Replace tokens for all job responses to alerts” By checking the appropriate box. (Microsoft say that this is a security precaution). ….Program Files\Microsoft SQL Server\MSSQL.n\MSSQL\LOG\ERRORLOG and ERRORLOG.n files. A new error log is created each time an instance of SQL Server is started, although the sp_cycle_errorlog system stored procedure can be used to cycle the error log files without having to restart the instance of SQL Server. Typically, SQL Server retains backups of the previous six logs and gives the most recent log backup the extension .1, the second most recent the extension .2, and so on. The current error log has no extension. The errors in the Error log duplicate those in the Application event log,. Messages about and any automatic recovery strategies attempted are written into the SQL Server Error log..
SQL Server maintains up to nine SQL Server Agent error logs. Each archived log has an extension that indicates the relative age of the log. For example, an extension of .1 indicates the newest archived error log and an extension of .9 indicates the oldest archived error log. Like the SQL Server ErrorLog, the SQL Server Agent ErrorLog is stored in a text file on the server. usually in the subdirectory \MSSQL\Log under the location were the SQL Server Instance’s code is installed. …%Program-Files%\Microsoft SQL Server\90\Setup Bootstrap\LOG\Files directory. The progress and outcome of all jobs is stored in system tables in msdb. These also contain a description of any errors, so should be monitored. Because user connection issues are sometimes rooted in the Windows NT security system, the DBA will need to check this. These problems are usually easily recognized when SQL Server reports that access to a specific resource has been denied. SQL Server problems can be caused by the failure of other services, which will be recorded in this log. Has the account the SQLServerAgent services runs under got sufficient rights to do what you want? Is The SQL Server Agent service running. If you’re using xp_logevent to trigger events, be aware that xp_logevent does not trigger an alert unless the @database_name for the alert is ‘master’ or NULL. When did the alert last work? Check the history values of the alert to determine the last date that the alert worked. Is the counter value maintained for at least 20 seconds? Have you specified the message recipient correctly? Is the client, on which a WMI management application originates, a Windows authenticated login or group in the instance of SQL Server specified in the application’s connection string of the application? Has the calling application cot the correct permissions in the database to create the required event notifications. I would say it is wrong otherwise how can you explain that you can raise for events that never go the error log or the event log? This is the way that SQL Server Event Alerts work, according to BOL and MSDN. Performance alerts, and WMI alerts work differently, of course. We were referring to SQL Server Event Alerts in the passage that you quote. Perhaps the alerts you are using are SQL Server Performance Condition Alerts? I agree that Alerts can be very confusing. Robyn and I were continually having to try things out to check, so the article took ages to write! Are you sure Alerts are not based on the log file? --an see how many times the alert fired. Re: Are you sure Alerts are not based on the log file? The raiserror with severity 16 is not a logged event unless you use WITH LOG. Severirty 19-25 are logged – see BOL sp_add_alert. You can’t change the ‘write_to_log’ for system messages – see BOL sp_altermessage. The sys.messages table has an is_event_logged value that indicates if the error is logged. I think message_id 50000 can’t be changed to be logging. Error 1205 is not logged and can’t be changed in SQL server 2005. It could be changed in SQL Server 2000. 1205 alerts no longer fire in SQL Server 2005. However, a WMI alert for a deadlock graph will fire. That’s one reason I’m looking at this article. Job Tokens Only In Job Steps? I just used a WMI alert to fire for a deadlock. I see that I can create a job to save information using tokens. I was going to ask if there is there any way to avoid this and use a token to populate the @notification_message value of the alert before it is sent. However, I just enabled token replacement – thanks to your gotchas – and it worked – sort of. It appears the DISCRIPTION also gets populated with the same XML that is displayed for the COMMENT. I was able to set @include_event_description_in to 0. Unfortunately, the XML is truncated. Looks like I will have to use a step to log the information anyway. Still, some of the “shorter” token values will be of use in the other alerts. However, in WMI alerts, the other tokens do not appears to work as expected. SQL Server should come with a standard alert system in place to send recommended alerts with useful information. While interesting, it is a waste of time to make everybody go through this. Technet gives the getting the Deadlock graph as their example of implementing a WMI alert. It is certainly a good use of WMI alerts. In earlier versions of SQL Server than 2005, the sp_altermessage stored procedure can be used to suppress system messages that have message IDs that are less than 50000. When these messages are suppressed, the messages are not written to the SQL Server Errorlog file. In 2005, this is not possible. This would mean that one couldn’t then use alerts on high-severity errors. I’m not sure why anyone would want to do this. I think Robyn is suggesting that we use sp_alterMessage for the reverse purpose, to allow logging on errors less than severity 19, so as to allow alerts to be fired. We feel your pain. As you’ll have gathered from the article we didn’t find WMI events easy. the inability in sql 2005 to enable logging for events has been a real backward step for sql server. I’m told that the ability to raise alerts on say error 1205 ( deadlock ) which you can’t do in 2005 is being looked into being re-introduced. In software releases into production I would usually enable logging on events such as missing permissions and incorrectly called/named objects – by writing these to the sql log it saved me having to constantly run profiler traces looking for errors. I think your aliens also went to the part of the program dev which handles alerts. Alerts And Blocking – Good Way To Go? I just discovered SQL Server Alerts in the last couple of days. (I’m not really a DBA, but have to administer a SQL Server 2005 if you know what I mean.) I’m trying to figure out if Alerts are the best way to monitor blocking problems. In general, the goal is to be notified of blocked processes that are blocked for more than 3 seconds. I can see that the Alerts for Performance Counters includes a way to monitor the number of Blocked Processes. I can also see that there are a number of Wait statistics that I could track. I’m guessing that some combination of these counters would get me close to what I want. But here’s the kicker. I also noticed in your article that the “gotchas” list says: “Is the counter value maintained for at least 20 seconds?” I presume this means that SQL Server only looks for performance counters every 20 seconds. (Yes?) So, if I’m looking for a list of blocking problems of duration 4 seconds or longer, then doing Alerts would not be the way to go. Is my logic sound? Or am I missing something? Do you have any off-the-top-your head advice on the best general approach to take for this task? Would an Agent job that runs every say 3 seconds (and that runs a stored proc that checks for long blocking problems) be a better approach? Or is that approach too resource intensive and not a good idea? It seems like this is a general need that most DBAs would have, but I’ve done a lot of searching the last couple of days, and I’m having a hard time finding general wisdom advice for this need. Re: Alerts And Blocking – Good Way To Go? I would go for the idea of using a stored procedure to run on the scheduler in order to identify blocking processes. The scheduler is very efficient, and as long as you don’t mess up with your code, you should be safe using this approach. I seem to remember that MVP Nigel Rivett has a very good procedure on his website to check for blocking processes. You are right in saying that the performance alerts are much better at giving you more general information and I’m not sure it is a good idea to use it for catching an event with a granularity of less than 29 secs. It may work but it wasn’t what it was designed for. Thanks for the feedback! Much appreciated. I’m going to give it a try and seek out Nigel Rivett’s website. Robyn and Phil..(hey where’s Phil’s pic anyway..although Robyn’s is nice to look at..:)) Great article that summarizes the different types of alerts without sinking into a morass of details. I was just playing around with SSMS alerts and decided to look more into the WMA alerts. Thanks for the comprehensive overview. I have tried setting up an Alert on BufferCacheHitRatio and it will not fire. I have set it to Falls Below 100. Any suggestions? SQLServerAgent Error: WMI error: 0x80041010. Hi, Quite new to this and have not managed to get this working in SQL 2000. Just wondering if some could provide a link to some documentation on passing Tokens to jobs in 2000 like the example provided for 2005? I tried using the example adjusted to using only square brackets etc but keep getting an error 120 message about the amount of columns not matching the select, even though this is not the case. I suspect my syntax is out. sp_alterMessage WITH_LOG does not work in Sql Server 2005 for messages with error numbers less than 50000. It did work in SQL Server 2000. How to capture a timeout from dotnet ? We are trying to determine comment exactly what happens when a timeout from .NET occurs and how it’s setup. Does it set a connection timeout? An execution timeout? Maybe there’s no lock timeout at all. Is there some alert that can capture this dotnet timeout? To test this I attempted to run this code below. Running the code, Profiler shows SQL:BatchCompleted event class for the wait command with and error “2 – abort”. Immediately after the line, I see an “Attention” event class with no additonal information. I’m impressed with this article as it very clearly explains the concept of SQL Server alerts. Thanks for writing! I have a quick question – can these alerts be set based on a data value change in a table? e.g., if the value of a Status column for a particular userid changes in a table, can I send an email alert to assigned people? This is a feature of Event Studio in Cognos 8, and I’m trying to see if SQl Server has similar functionality. Thank you for the informative article. I appreciate immensely that you go beyond simply reposting Microsoft documentation. I hope you might have a suggestion for me; I’m working with SQL 2008. I have a few T-SQL batches that are called by an app, and would like to provide some traceability without needing ‘sysadmin’ or similar high-level permissions. For my needs, traceability means simple messages like “Batch xyz started,” “Batch xyz completing,” etc. I tried RAISERROR with a severity of 1 thinking “0-18, any user,” but it appears that adding WITH LOG takes precidence and requires sysadmin. Likewise ‘sp_OACreate’ requires sysadmin. I also looked at xp_logevent, but it requires db_owner on ‘master.’ I’m considering a “tracing” table in the database, but would like to externalize the trace messages, if possible.